Left to right: Peter Harris, co-founder and CTO of Romeo Power, and Michael Patterson, founder and CEO. PRNewswire photo. 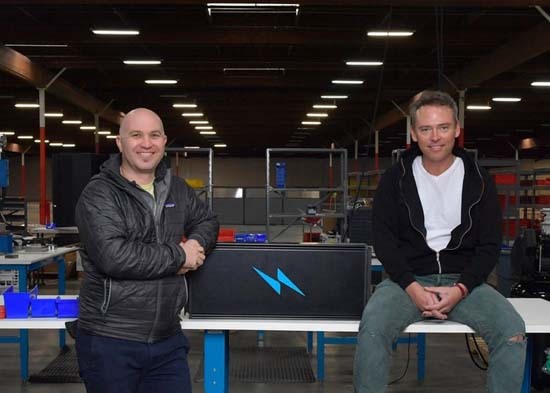 VERNON, Calif.– Romeo Power, a Southern California company founded in 2016 to design and manufacture electric vehicle battery packs, has expanded its manufacturing capabilities with the addition of a new, 113,000-square-foot facility in Vernon, California, just outside of Los Angeles. The company, launched last year by tech innovators Michael Patterson and Porter Harris, manufactures battery packs ranging in size from 1 kWh to 1 MWh at the new facility, Romeo Power said in a press release. "Our new factory is a full service facility, encompassing research and development, engineering, testing, and manufacturing under one roof. It will enable up to 8 GWh of energy storage production on a single shift and produce a high mix of customer solutions utilizing a common manufacturing recipe to unlock industry-leading production pricing," said Mark Schwager, chief production officer of Romeo Power, in the company's release. The expansion supports the electric vehicle market as major auto manufacturers are expected to introduce more than 50 new electric vehicle models by 2020. The expansion also creates jobs in Southern California: Romeo Power said that it is hiring an additional 200 manufacturing personnel in 2017. New research and development capabilities include a "world-class testing lab complete with extensive vibe, shock, thermal cycling, high power cycling, safety testing, and cell level characterization and testing," the company said in its release. "We are innovating in design, thermal management, and materials to push electric vehicles to the next level," said Michael Patterson, co-founder of Romeo Power, in the release. "Our high-energy density packs increase performance and range, helping auto makers win market share. Our modular gravimetric energy density exceeds 225 Wh/kg, with volumetric energy density at or over 390 Wh/L." the company said in its release. The company (www.romeopower.com) is engaged to design and produce for several tier 1 OEMs. In all, Romeo Power expects to be at 1 GWh of capacity by the end of 2017 on a single shift. It also expects to quadruple its capacity in 2018 and then double again by the end of 2019, the release said. "Romeo Power is committed to engineering and manufacturing the most advanced, safest, and cost effective battery and energy systems in the world," said Porter Harris, co-founder of Romeo Power, in the release. "Romeo Power supports technology that advances humanity and humanitarian efforts globally, bringing access to clean and sustainable energy to all."